The Human Race Theatre in downtown Dayton, Ohio often times takes risks on new material. It paid off with BAND GEEKS. They have a new musical festival every August, and some of those have been really good including PUMP UP THE VOLUME and RED BLOODED ALL AMERICAN MAN. And then there are shows like PLAY IT BY HEART. PLAY IT BY HEART is the story of a country music legend and her family dynasty, which all comes raveling apart by the reveal of a family secret. There is drama, tension, and bad feelings amongst the family and others who have come and gone throughout their glamourous lives. The problem is I didn’t believe any of it. Perhaps as a TV movie this would play well but on stage it just felt flat. I also wonder if it would have done better had it been a story based on a real country artist; surely Reba or Trisha or Martina had enough drama in their careers to make for juicy melodrama? And then the show would have benefitted from country classics rather than “Broadway-country” show tunes that just didn’t click. My biggest problem: The dialogue was amateurish and contrived. I wondered if those actors struggled to read some of those lines with a straight face. Brian Yorkey, who also wrote the modern classic NEXT TO NORMAL, missed on this one. It happens. There were a few moments in the first act that held my attention; the “I’m Sorry” duet between the Jasper sisters was good and one of the few songs I enjoyed. (The band was fantastic, though!) The big, belty, climactic number at the end of Act One showed that Trisha Rapier is far better than this material and that her marvelous performance as Diana last year in NEXT TO NORMAL wasn’t a fluke. I was also drawn in each time Kathryn Boswell (“Jamie Lynn Jasper”) and George Psomas (“Naji Habib”) were on stage. They had good chemistry and charisma; I would love to see them work together again with a better script. All in all, I appreciate theatres taking risks on new works – we can’t just rehash the classics year after year. Human Race is brave and makes bold choices. And sometimes it doesn’t work. I think that’s OK. Regardless, I will be back time and again to marvel at their courage and creativity . . . because more often than not, those risks pay off. Don’t take my word for it! Go see for yourself and support local theatre. 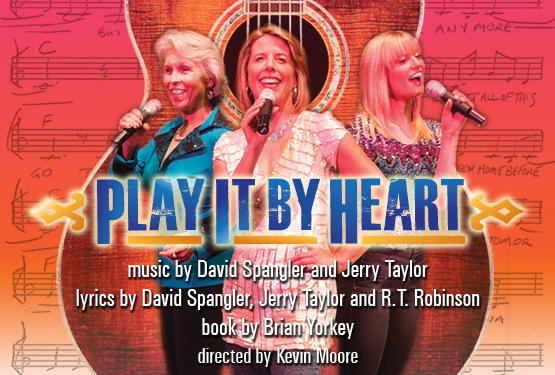 PLAY IT BY HEART plays at The Human Race Theatre through July 6th. Tickets are available and more information are available here. Previous ROAD TRIP: A Legally Blonde Adventure! I agree 100% with your review!